Setting the table for breakfast may not be feasible on busy days, but you can set aside one day a week when you present the most important meal on your best dishes and with the proper place settings. Relax and enjoy your cup of coffee, served with its matching saucer, and treat yourself and friends or family by using your nice dishes and silverware. 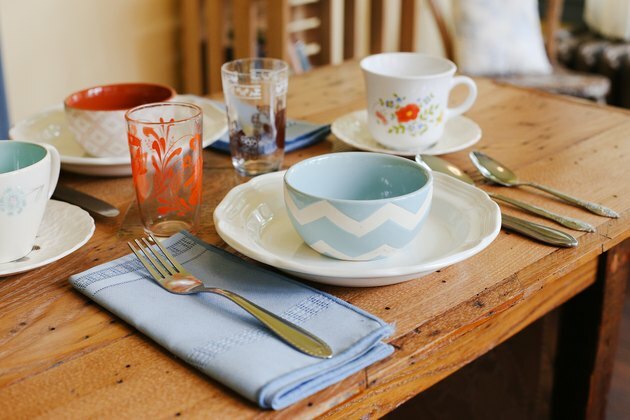 Setting a table for breakfast doesn't mean spending a lot of money on fancy bone china or designer dishes, but it does mean setting your own dishes out in the nicest way possible. Most breakfast place settings include a cup and saucer for hot drinks, a juice glass for cold drinks, silverware, salad-size plate for toast or muffin, and a bowl for hot or cold cereal. Each person should have a salad-size fork, butter knife and two spoons -- a larger one for consuming cereal and a smaller one for stirring the hot drink. Put the plate at the center of the individual table setting, with the napkin and fork on the left and the other silverware on the right. To the upper left of the plate is the juice glass, while the cup and saucer go on the upper right. Elevate your brunch from dull to memorable with the proper table settings. 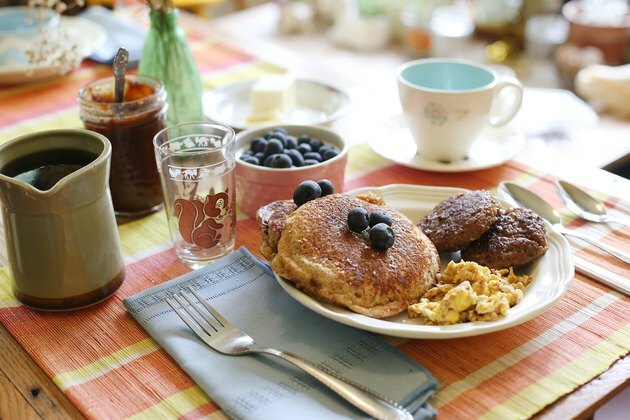 Brunch is a combination of lunch and breakfast, and so is the brunch table setting. Use the basic breakfast setting, but add a dinner-size fork along with the salad fork. If there's an alcoholic beverage choice, such as a bellini or mimosa, provide a champagne flute. If children and adults are both present, be sure to provide plastic juice cups that are an easy fit for little hands. 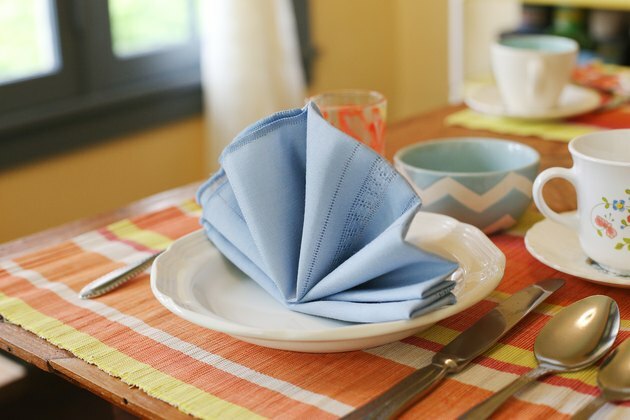 The napkin can either be on the left side of the plate or folded like a fan and placed in the center of the top dish. Include space in the center of the table for serving vessels and utensils that relate to specific items on your breakfast or brunch menu. 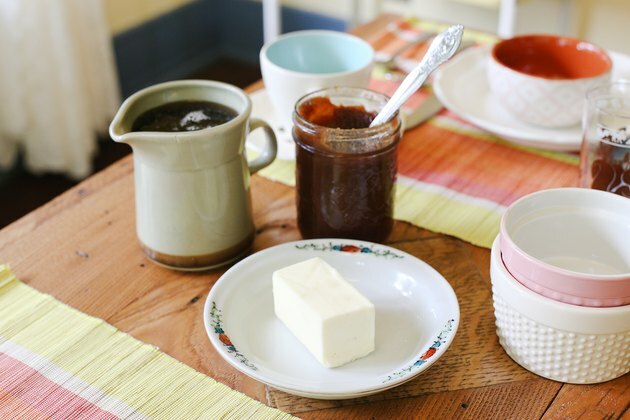 For breakfast, these could include a small pitcher of syrup, a clean dish for butter, and jams or jellies in small, clean bowls. These same items could also be a part of your brunch table setting, but be sure to use your nicest dishes. For brunch, leave room for a carafe for coffee, pitcher of hot water, an assortment of tea bags, as well as a sugar bowl and pitcher of cream. Place a pitcher of juice on either side the table, and, if applicable, a pitcher of the alcoholic beverage. Be sure to label them clearly should they look too similar. Provide salt and pepper shakers on each end of the table. Use other elements, such as those you usually reserve for holiday meals, to make the breakfast or brunch special. A pretty tablecloth covers the most imperfect of tables and can be used as the cohesive decorative element. 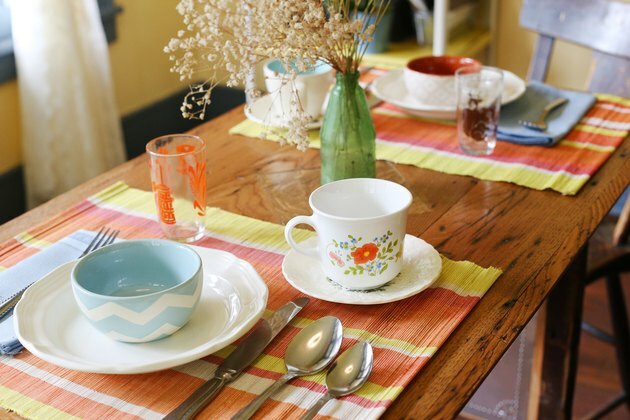 If you have mismatched, but complementary, dishes, use a solid tablecloth in a neutral color such as beige or white. If you have matched dinnerware in white, add visual interest with a multicolored damask tablecloth or with a lace tablecloth over a solid one. If a tablecloth isn't an option, use matching place mats and, if you want to make it fancier for brunch, add place cards. A centerpiece of flowers, either in a single vase or a series of small vases, is always welcoming to guests.